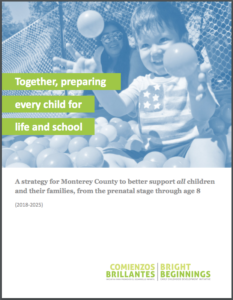 Imagine if all children in Monterey County lived in safe, nurturing homes and communities and were healthy, valued, successful in school, achieving their full potential. That is the vision of the Monterey County Children’s Council and Bright Beginnings. Bright Beginnings is an opportunity for the community as a whole to work together to ensure that young children, from the prenatal stage through age 8, have what they need to succeed. This initiative aims to maximize community efforts to improve early childhood development outcomes through effective coordination, capacity building, empowerment, and strategic action for children and their families. Research confirms that community investment in early childhood development, especially for children from socio-economically disadvantaged families, yields the highest returns on investment. These investments improve not only their cognitive abilities, but also crucial behavioral traits like sociability, motivation, and self-esteem. Studies that have followed children through their adult lives confirm enormous payoffs for these investments, whether measured by success in college, higher income, or lower incarceration rates. 2015-2016 was the first year of external evaluations for Bright Beginnings. Spark Policy Institute, the external evaluator, conducted a mid-year and end of the year evaluation of the Bright Beginnings initiative. These external evaluations have helped Bright Beginnings craft the Bright Beginnings’ Strategic Work Plan that will be implemented through January 2018. You can also view and download a summary of our Strategic Framework in English or Spanish.